If Grant doesn’t have anything lined up this summer I wouldn’t mind seeing him here working alongside GJ. With so many below par performances today hopefully we’ll see a positive reaction in the players over the next few games. I think a lot of fans like myself are 50/50 with Johnson where if he goes people will accept it and look forward to change but if he doesn't people will allow him another year to build. There are also the small minority who think he is perfect and can do no wrong or who want him gone immediately and chant for him to go. The argument however of there is no one better is laughable there is likely to be someone who could do better just as much as there is someone who could do worse which isnt likely given how poor the last 2 seasons have been. Ultimately season ticket sales will dictate how the fans feel anything under 800-1000 will be less than the last couple of years and will be concerning. I do not think it is the profession of anyone on this board to go out finding managers> But as a very rough guide, there are 15 others in League 2 who seem to be performing better. That is unless you believe that somehow we fluked getting in GJ, the best we hav or could have. Nobody as any idea what another could do. It has been a poor season and people are quite right to question what is going on, without having ALL the answers? May be wrong but I doubt we'd find anyone with a track record to match GJ who's proven he can do it at this level and above. If there was an obvious candidate then I wouldn't necessarily be opposed to it, but if it's between sticking with GJ and taking a punt on a younger/unproven manager from the lower leagues I'd personally prefer the former. If we haven't progressed any further by around Christmas, that's when I'd start to seriously consider a change. At some point every club has to ‘take a punt’. If unknown or inexperienced managers were never given a chance there would be 92 to League managers and never a new face. Cowley, Jones, Flynn, Kewell, Artell, Jolley are all ‘punts’ from the last couple of years, for example. In fairness Cowley was doing exceptionally well at Braintree the others had no mgmt. experience. As for Grant he's a playing legend and seemed to do reasonably solid job at Peterborough for two seasons on presumably a healthy budget but I fail to see why that entitles him to the job here assuming the mandate is to at least finish top half next season. Oh dear oh dear (thought I would also try the intellectual approach). Got us up - no argument about that. Could another manager have done it ? We will never know. Improved the squad - not the hardest task to be handed to an experienced manager. If you believe that we are so average and you believe GJ us so good, how come we ended up together in the first place? Which of your two conditiond did he fall into ? He does deliver those type of free kicks well. Concern is that are we turning into a one trick pony from that situation ? Bloody hell Robin you're hard to please! Read your words back to yourself. A playing legend and has experience at a higher level than we are currently at. I can't beleive you are so dismissive of him! He seems just what we need at the mo. Young, hungry and with a point to prove! 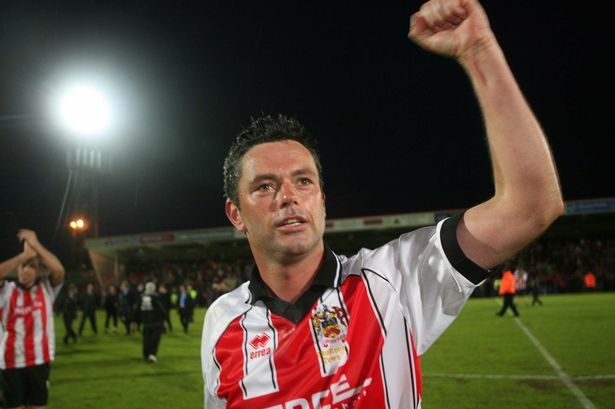 Grant still looks out for CTFC. Still comments on our games on Twitter from time to time. Has more league experience than the up and coming over achievers in non-league like Garrard (who is looking like the next Cowley). My point is other than the fact he was an ex playing legend he is no way qualified for the role, please explain to me how that statement is untrue. I'd like a manager who a promotion on their CV, ideally at similar clubs to ourselves, and who has good contacts in the game at the very least. That's the reason I am still backing him, I wouldn't mind Grant if GJ left for a bigger club but it would be a downgrade on just about every comparable metric. Did you consider Yates a downgrade on Allen when he was appointed? Yes both ex players but a "punt" that would get fans behind them and give them some time to sort it. I think what pisses off most people is the general lack of. effort from the players and the manager has to take some responsibility for this. They can’t necessarily make players more skillful but if they can’t get the players to give 100% in a game of this importance then I agree there is something wrong. You can’t have players turning up and performing only when it suits them. Please no, Downes has zero mgmt. experience and although a nice guy it doesn't mean he's a decent mgr. Gill has just started out at Bath, if he has some success there then we can consider him. Interesting question. I think at the time Allen had to go, Yates had some limited experience at Kiddy and from the outside had done a good job getting them to the trophy final. In truth I don't think I compared the two but was cautiously optimistic regarding Yates particularly as the Kiddy fans were not sorry to see him go. But on all comparable metrics Yates was a downgrade - no league experience or promotions! Then yes he was, remember two good seasons aside most of his time here was miserable. You can't blame Yates for his first 6 months, he was working with what he had. He then had a brilliant first half of the next season, poor second half - so that evens out. Then 2 playoff seasons followed by one struggle before being sacked two months later. The maths suggests that the majority of his time here was not miserable. But the 'struggle' started *before* the end of the second playoff season!!!! Well before, in fact. He's performed a miracle at Solihull Moors. They were rock bottom when he took over and they can now finish as high as 12th. One final, one semi, to be a pedant. No he didn't. Not unless I missed the two abject performances against Northampton get overturned by the FL while I was still drowning my sorrows about what should have been, that season. They were hardly abject. We were beaten by a better team over two legs. If Pack had scored his penalty it could have been a different story. Sorry my mistake. Should have said 'play offs' not 'finals'. He wasn't the disaster that many on here make him out to be. Not a disaster at all, just a victim of the cycles low budget L2 clubs go through. Two years where our patchwork of cast offs, kids and loans gelled amazingly and performed well, and when they moved on the next patchwork didn’t work out. Just the way it goes when player churn is so high. We may sign 8 unknowns or uninspiring players in the summer who unexpectedly click and thrash L2. Just the way it goes.